A few months back I posted a recipe for a powdered dishwasher detergent. I got a ton of positive feedback, and the recipe seemed to work great for most of my readers. However, there was a subset left unsatisfied – which is totally unacceptable to me! I had requests for a liquid version, as some machines will only do well with liquid. As well, my readers with hard water were experiencing less-than-stellar results. I knew I had more work to do . . . In a small saucepan, combine water and vinegar over medium heat. Bring to just boiling and then reduce to low heat. Add each additional ingredient, one at a time, whisking as you go. Make sure everything is dissolved before removing from heat. Allow to cool and then transfer to a storage container. When completely cooled the solution will separate into two layers, so shake it up real good before use. I use 2-3 tablespoons per load. I also fill the machine’s rinse indicator with white vinegar – a very important step. Don’t skip this part! It will keep the dished ‘soap-scum-free’ and extra sparkly. Enjoy, and happy green dishwashing! I am a plumber’s wife and he ONLY recommends liquid detergents for dish washer or laundry. The powder form will eventually turn back into a solid powder form that is more like concrete in your plumbing. Not good for you or your local plumber. Just an FYI. okay i like made a big batch of this and my dishes came out so cloudy. I used vinger for the rinse..what did I do wrong? And is there a way to salvage what i made? We have really hard water here. Do you think adding Lemonshine or citric acid to the receipe would help? If you can stomach shopping at Target, I’ve seen Dr. Bronner’s there. I’ve also seen it at Kroger in the pharmacy aisles, so your local grocery might have it (just not shelved with…you know…soap). Hi there, I have LOTS of questions….Are you ready??? 1.Is there a cleaning difference between table salt vs. Kosher salt for the dishwasher detergent recipe? 2. I have soft water, do I need to alter the dishwasher det. recipe? 3. Can I use the homemade dishwasher detergent for those times I want to wash some dishes by hand? Because I just went out and bought all the ingredients for a dishwasher detergent recipe I found on another site, it uses mostly all of the same ingredients. 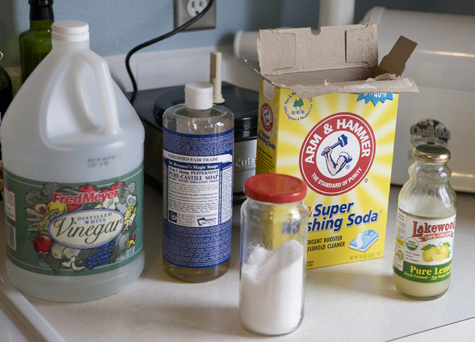 Here are the ingredients- super washing soda, borax, baking soda, white vinegar and 3 essential oils, tea tree ( to disinfect , the recipe said), lime( for the citric acid, can I use an essential oil instead of a food-grade citric acid?) and lavender ( for the scent). I bought the oils for some other cleaner recipes. But maybe one or all would work for a dish soap recipe too.?? I appreciate your willingness to experiment !! Thank you so very much, cant wait to find out what you came up with! 1. Not sure, but I think any salt will do. 2. I don’t have soft water so I can’t say for sure. If you read through the comments though, here’s a lot of discussion from people who have both hard and soft water. I’m not sure the essential oil will actually contain citric acid. I’d look into that, but I’m thinking it wouldn’t have any citric acid in effective quantity. Where can I find Castile Soap and essential oils? Health food store/co op, or online! Amazon has great prices. Target carried Castile soap, it is located in the aisle near Burt’s Honey Beauty items. 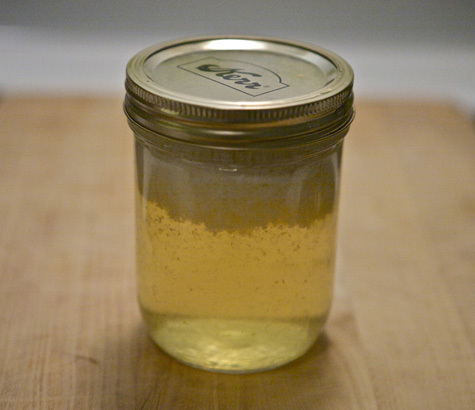 You should never mix castile soap and an acid (vinegar, lemon juice). It’s not a toxic combination, but the castile soap is a base and the vinegar and/or lemon juice is an acid. They will completely cancel each other out. In fact, the acid will break the soap down back to it’s original oils and end up causing a gross, greasy mess which will end up on whatever you’re cleaning with it. Sad, but true. I got this information from Dr. Bronner’s website. can you use this as liquid dish detergent as well as dishwasher detergent? The castile soap has oils in it, as far as I know. It is not recommended for septics either b/c it builds up in the pipes. Wa, wa, I so wanted to try this! I’ve seen it at market basket if you have one in your area. But I’m going to try and find some at my local dollar store before I buy it there. I would save so much if I bought it at Walmart but I am trying to shop there less and less. just ordered a 50lb bag for $9!! THank you for this! Did it stay like that? or did it eventually separate? I make a lot of these products I find for gifts & things & I would feel better about it if it were less separated. Hve you heard of soapnuts? I use them for hair shampoo, laundry soap, dishsoap, dishwasher, clean windows, etc etc….and they are so cost effective. Go ahead, I dare you, google it!!!! I thought you just said don’t mix castile soap with vinegar and or lemon, but your recipe for dish washing soap has lemon and vinegar in it…..confused with this!!!! Just and FYI when you add the washing soap it will seep over your pan so be ready for the solution to go everywhere.